For The complete website Click Here. This is our wiki from the workshop ... and beyond. Anyone is welcome to contribute to the site by first joining the discussion group. Goal: The goal of the workshop was not to produce a white paper! Rather it was to identify a set of requirements, and a group of willing participants to develop a mandate, open source code and a set of deliverables to be used by scholars to accelerate data and knowledge sharing and discovery . Our starting point, and the only prerequisite to participating, was the belief that we need to move Beyond the PDF (meant to capture a common philosophy, not necessarily to be taken literally). In a heady moment we might also describe our efforts as the desire to contribute to the development of a free and open digital printing press for the 21st century. A platform, when utilized, moves us beyond a static and disparate data and knowledge representation to a rich integrated content which grows and changes the more we learn. A system (content plus platform) from which a scholar can interact and once evaluated shows improved understanding and interest. The original workshop proposal can be found here. Prior to the workshop participants were given a set of components (under files) that comprised a scientific workflow - from ideas, to grant, to hypothesis, to experiment, to data, to software written, to final publication and even a press release. Attendees were asked to use components of the workflow and the data to illustrate what their tools do, or what they propose to do. Short talks (see program, webcasts, twitterfeed and twitter archive) were followed by discussion and the major issues identified leading to a La Jolla Manifesto (under review) and a set of deliverables to move us towards common goals. One major goal is to use our tools to have some positive impact on the understanding and treatment of spinal muscular atrophy (SMA). 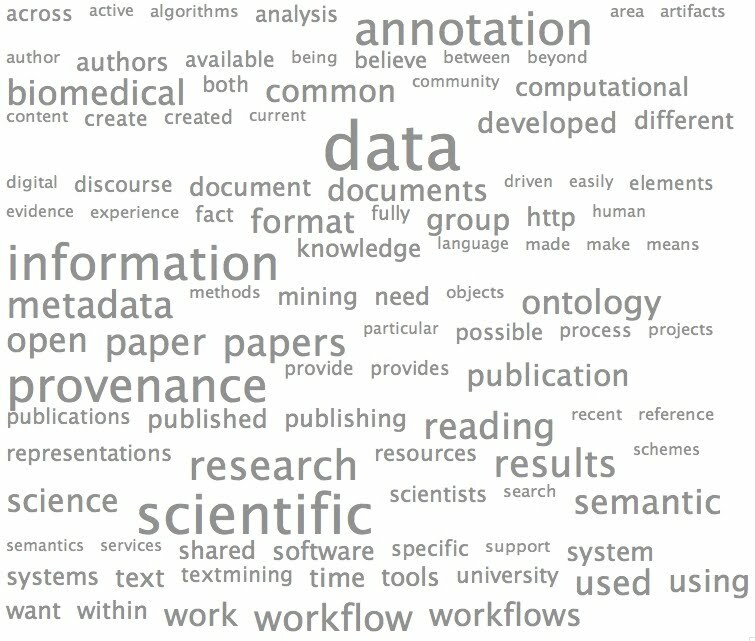 An emerging list of software tools discussed at the workshop can be found here. A draft final report of the workshop can be found here for discussion group members to review.